In the 1950s, Richard Sheffield, a teenage friend of Bela Lugosi, found two stills which he believed were from He Who Gets Slapped in one of Bela Lugosi’s scrapbooks. The photos showed an actor whom he thought looked like Bela in clown costume and makeup. Richard did not ask Lugosi about the film, and no documentary evidence has yet been discovered to substantiate his participation in it. At the Capitol this week there is a picture which defies one to write about it without indulging in superlatives. It is a shadow drama so beautifully told, so flawlessly directed that we imagine that it will be held up as a model by all producers. Throughout its length there is not an instant of ennui, not a second one wants to lose; it held the spectators spellbound yesterday afternoon, the last fade-out being the signal for a hearty round of applause. This celluloid masterpiece is Victor Seastrom’s picturization of Leonid Andreyev’s play, “He Who Gets Slapped,” which was presented before the footlights in January, 1922, with Richard Bennett in the principal rôle. The more enlightened producers were enthusiastic over Mr. Seastrom’s “The Stroke of Midnight,” which was at the same time considered too depressing to be a financial success over here. Nevertheless, this and other productions caused the management of Goldwyn Pictures, Ltd., to engage this director to make pictures in California. Mr. Seastrom left his native heath, Sweden, and his first American-made production was Sir Hall Caine’s “Name the Man,” a lugubrious story filled with anachronisms. A friend of the director predicted at the time that, although he did not like “Name the Man,” Mr. Seastrom eventually would turn out a production which would startle the film world. Undoubtedly the story is half the battle with an accomplished director, and in “He Who Gets Slapped” Mr. Seastrom obviously realized that he had his great opportunity. He selected his cast with punctiliousness, choosing Lon Chancy, who will be remembered for his work in “The Hunchback of Notre Dame” and other films, to play the part of the heart-broken scientist who became a clown. Never in his efforts before the camera has Mr. Chaney delivered such a marvelous performance as he does as this character. He is restrained in his acting, never overdoing the sentimental situations, and is guarded in his make-up. The first flash on the screen shows a clown twisting a colored ball, which gradually fades out into the figure of Beaumont, the scientist, gazing upon a revolving globe. There are many such clever touches in different chapters of this absorbing narrative which deals with the ultimate revenge of the scientist-clown, merely known as “He Who Gets Slapped,” on the man who stole the glory for his work and also his wife. You see the student arguing with Baron Regnard before a gallery of aged notables, and suddenly the nobleman slaps the scientist’s face. The old men rock in their mirth, and this, coupled with the loss of his wife, spurs the student to become a clown with a small traveling French circus. As the principal fun-maker, with a score of other painted-face clowns, he is seen making audiences roar with laughter by being slapped. At that time he had no thought of revenge, but one day he sees the Baron in a seat. The sight of what happened to him in front of the scientists comes before his eyes. 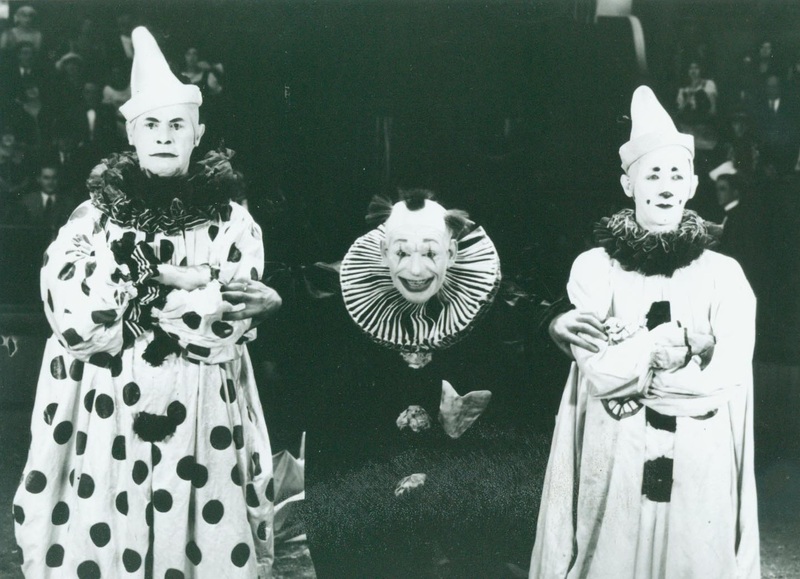 One sees the clown fading into the gallery of wise old men, and then again the clowns are shown. There is the dressing room of the circus, and the pretty daughter of an impecunious Count. The girl (Norma Shearer) soon falls in love with her partner in her riding act, Bezano (John Gilbert). The Count wants her to wed the Baron, and the scheming is discovered by He, the clown. He is weak in fistic encounters, so coolly arranges for a terrible death for the Count and the Baron. He loves the girl, Consuelo, too. She had stitched on his dummy heart night after night of the show. You see him move the lion’s cage up to the door of the little ante-room, which is all ready for a wine supper. Then he enters himself by another door, and in an encounter with the girl’s father heis stabbed by the Count’s sword-stick. He grips his breast tightly to stay the flow of blood, and gradually crawls toward the door, which has only to be opened to release the wild beast. There is wonderful suspense in this stretch, and one is stirred when one sees the startled lion spring through the open door. Mr. Seastrom has directed this dramatic story with all the genius of a Chaplin or a Lubitsch, and he has accomplished more than they have in their respective works, “A Woman of Paris” and “The Marriage Circle,” as he had, what they did not have, a stirring, dramatic story to put into pictures. Miss Shearer is charming as Consuelo, and Mr. Gilbert, who gave such an excellent account of himself in “His Hour,” is a sympathetic sweetheart. But the player who is entitled to honors only second to Mr. Chaney is Marc McDermott, who takes full advantage of the strength of his rôle. Tully Marshall is splendid as the scapegrace Count. For dramatic value and a faultless adaptation of the play, this is the finest production we have yet seen. He WHO GETS SLAPPED, with Lon Chaney, Norma Shearer, John Gilbert, Tully Marshall, Marc McDermott, Ford Sterling, Clyde Cook, Harvey Clarke, Paulette Duval, Ruth King, Brandon Hurst and George Davis, adapted from Leonid Andreyev’s play, directed by Victor Seastrom; overture, “1812,” Tchalkovsky; “Fifth Anniversary of the Capitol”; ballet corps, “Dance of theHours”; “There Is No Death,” Geoffrey O’Hara. At the Capitol.